We only use domestic Pokubara pork that is antibiotics and chemicals free, and asparagus seasoned with salt and pepper. Meat has a soft texture because it was sliced to 1.6mm. 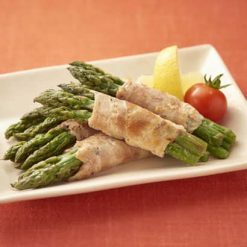 Simply grill them after thawing and serve..
We wrapped asparagus with pork. Perfect for lunch side dish. Our products’ original meat is obtained from livestocks that were raised on carefully selected feed at contract farms in Aomori and Ehime in Japan. Healthy pigs raised in a clean environment feature thin muscle fibers and juicy meat. In an effort to achieve thorough safety, we start by raising pigs for three generations before using them for our products. We harvest vegetables in season and freeze them immediately after harvest to fully capture their freshness and nutritional value. Currently, we promote organic vegetable production techniques toward the production of safe, high-quality vegetables. The company has contract farms not only in Japan, but also overseas, where organic vegetables are grown under strict standards. 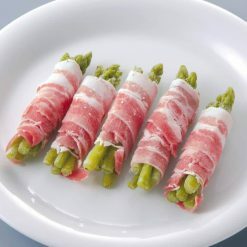 Thaw this product in the refrigerator and grill immediately after defrosting.Put a small amount of oil in a heated frying pan and grill the thawed “pork wrapped asparagus” for about 4 minutes while rolling them over occasionally over medium heat. Then stop the fire and put a lid on the pan to steam for about 1 minute. This product contains pork meat (domestic), asparagus, salt, pepper, yeast extract. Asparagus are loaded with nutrients and are a very good source of fiber, folate, vitamins A, C, E and K, as well as chromium. Asparagus also is a great source of the fiber inulin, which studies have shown to suppress appetite. Servings of asparagus have been proven to aid in weight loss. Asparagus is also a natural diuretic, with high levels of the amino acid asparagine. Eating asparagus spears can help flush out excess fluids and salt to help prevent urinary tract infections. This product is not suitable for anyone with allergies to pork. The recommended shelf life for this product is 12 months. Origin of ingredients: pork (domestic), asparagus (China). Prepared and packaged in Japan.